Green Dragon handmade soap has the fresh scent of leaves and sweet grass. As you use it, the scent will open in the warm water releasing its subtle, green and distinctive fragrance. Great scent for men. Buy a bar for a birthday or a Christmas stocking. Buy Green Dragon handmade soap and feel refreshed. It has a distinctive scent of green leaves and sweet grass. This is a cold process soap with the addition of hand painted green glycerin soap dragons on top. As you use it in your bath or shower, the scent will open in the warm water releasing its subtle, green and distinctive scent. 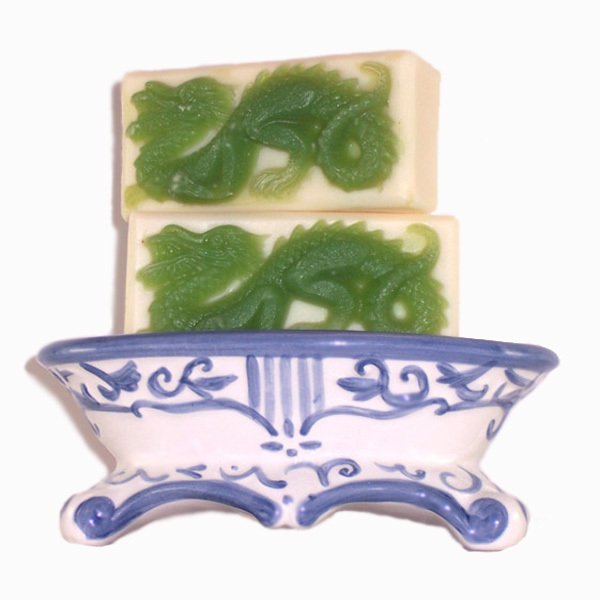 If you love green, clean and fresh, you will love this handmade Green Dragon soap. It blooms in your bath or shower, releasing its distinctive fragrance. My soaps are made with the cold process method in the European tradition. Both my mother and grandmother made soaps in the Czech Republic and I am following in their footsteps. I have been making soaps since 1969 and selling online since 1991. I prefer not to gel or cook my soaps, so the essential oils or fragrances stay true. For some of my soap batches, they go in the refrigerator or the freezer; up to overnight. Green Dragon soap has been cured for 8 weeks to make it extra mild and long lasting. This way it will last longer in your shower or bath. Experience the awakening sensation. Buy this soap in a masculine scent for boys, guys or men for a birthday or a unique Christmas gift. Each hanmdade soap bar is unique and hand painted with a green dragon.